If you make an effort to recycle each week, you’re probably aware of what materials your local recycling services accept. However, as the junk for the week piles up, sometimes it goes beyond just paper, plastics, glass, and aluminium. So, what should the environmentally conscious consumer do with everything their recycling services won’t pick up? 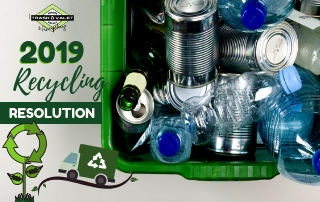 Before you give up and throw it away, here are a few tips for recycling items you might not have known you could recycle. Everyone knows about giving their clothes to Goodwill, but that’s not all Goodwill accepts in the way of donations. Old appliances, and even furniture, are always welcome (and someone will probably find it useful, too). If your appliance is broken and past use, you can also ask the Steel Recycling Institute to pick it up and recycle the materials. Usually, batteries are a big no-no when it comes to recycling. Most batteries contain hazardous materials like lithium, mercury, and silver and if that leaks onto the rest of your recycling, it will all be, quite literally, a waste. 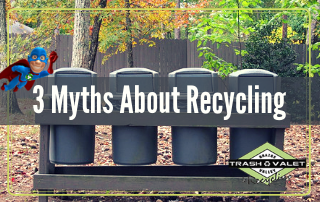 However, there are programs dedicated specifically to recycling batteries. Check your area for battery disposal options, like Staples’ electronic waste recycling. You can drop off rechargeable batteries at Best Buy or Office Depot, as well. Here’s another “throw out everything you know about recycling.” While light bulbs might not be the best suited for your recycling bin at home, you might be able to just take them back to the store. Ikea and Home Depot will accept recycled Compact Fluorescent lightbulbs, and other stores are starting to pick up the trend. If you don’t have a Home Depot or an Ikea near you, it couldn’t hurt to just ask the nearest home improvement store. Bikes Not Bombs is a nonprofit organization that accepts used bikes, bike parts, and gear. They send thousands of bikes each year to economic development programs all over the Global South. They also have youth programs like Earn-a-Bike, where kids will restore and learn to safely ride their own bike, which they earn at the end of the 6 week program. You might be able to get creative with upcycling wine corks before you throw them out, but if you must recycle them, there are companies that will collect used wine corks by grinding the cork down and reusing it. 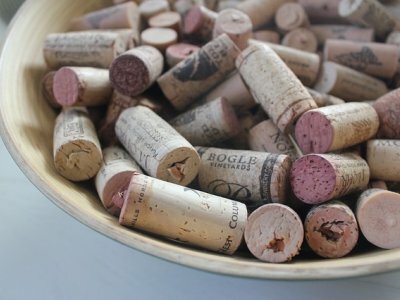 Cork is a natural, renewable resource, so companies like ReCORK try to promote recycling your corks. Just look for your local ReCORK drop-off location. You can also buy cork products from them. 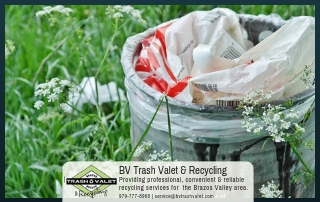 If you live outside of Bryan-College Station city limits, however, you may have a difficult time finding anyone to pick up even your curbside recycling. 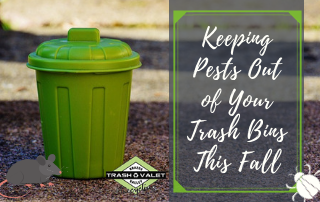 Fortunately, Brazos Valley Trash Valet can help with that. 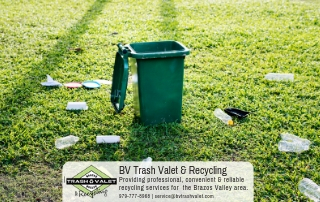 They accept plastics #1-7, while most recycling services in the area accept just #1-2, and they will pick up your curbside garbage and recycling weekly at a reasonable price.